Starting a small business is tough. Competition is fierce, consumers are already overwhelmed with adverts, and your marketing budget is basically non-existent. Still, you’ve got to get people’s attention – but how? One effective strategy is guerrilla marketing. This innovative, scrappy, and highly effective marketing strategy helps to level the playing field. Every small business can harness the power of a great guerrilla marketing campaign to capture attention and generate sales. So what exactly is guerrilla marketing? This article will explain all with inspiring examples and key takeaways to help you get started. Guerrilla marketing utilizes unconventional strategies to get consumers’ attention and create buzz about the product or brand being marketed. It’s disruptive, provocative, and memorable. This marketing method is named after guerrilla warfare. This is when a small independent group uses irregular tactics to fight a larger and more capable force. Think “ambushes, sabotage, raids,” says Creative Guerrilla Marketing. Good guerrilla marketing campaigns take consumers by surprise and create an emotional reaction. Charged emotions lead people to take action, tell their friends, and get involved in the campaign in some way. In turn, the campaign message spreads far and wide. Ideally, these emotions will be shock, surprise, delight, curiosity, and admiration. The use of the word “guerrilla” to describe these styles of marketing was popularized by advertising expert Jay Conrad Levinson in the book Guerrilla Marketing. As Levinson suggests, one of the key benefits of guerrilla marketing is that it’s cheap. Although some guerrilla marketing campaigns can cost a lot of money, they don’t have to cost any money at all – some of the examples below prove this. “Guerrilla programs usually start when a client says to us, ‘we don’t have any money but we’d really like to get some media attention,’” says Neisser. In summary, guerrilla marketing is all about creativity, connection, and impact. So what does guerrilla marketing look like in action? A quick Google image search for “guerrilla marketing” will return countless results of guerrilla campaigns. Each of the seven guerrilla marketing campaigns we share below is creative, powerful, and truly guerrilla. What’s more, most guerrilla marketing campaigns also tend to take place offline. But, we’ve taken the time to find effective online guerrilla marketing campaigns to inspire digital entrepreneurs to get creative. This creative guerrilla marketing idea was thought up to promote the sci-fi film Ex Machina. How? By using Tinder. This was a good start. The guerrilla marketing campaign took place in Austin, Texas, during the SXSW (South by Southwest) festival in Austin. Each year, this music, tech, media, and arts festival draws hundreds of thousands of people to the city. So there are a lot more people swiping on Tinder than usual. Plus, out of the countless brands and businesses competing to capture the attention of festival-goers, it’s likely that none of them were using Tinder to promote their messages. The marketers created a Tinder profile for Ava, the artificial intelligence character from the film. When users swiped on the attractive profile of a young woman, they received questions from a Tinder bot. It was sneaky, ingenious… and perhaps a little heartbreaking. Here’s a screenshot of the genuine conversation one guy unknowingly had with Ava the artificial intelligence. Just when Brock thought he was about to meet the love of his life, he noticed something was amiss. When he visited Ava’s Instagram profile, it contained just one photo and one video – both promoting the movie Ex-Machina that just happened to be premiering in Austin during the festival. It’s a brilliant guerrilla marketing campaign that tied in perfectly with the movie’s artificial theme or artificial intelligence and complex human relationships. In retrospect, you also realize that Ava’s Tinder chat questions were those of a robot trying to understand what it’s like to be human. It’s true that some thought the campaign was spammy or invasive. Still, it achieved what every great guerrilla marketing campaign should: It got people talking and made news headlines around the world. Look for ways to incorporate aspects of your brand into the experience. Find a communication channel to get your message across that other brands aren’t using. French charity Médecins du Monde (or Doctors of the World) wanted the city of Paris to draw attention to the growing homeless population in the city. What they did was both simple and powerful. They realized that part of the problem was that homelessness was “out of sight, out of mind,” and that to create meaningful change, they had to raise awareness. 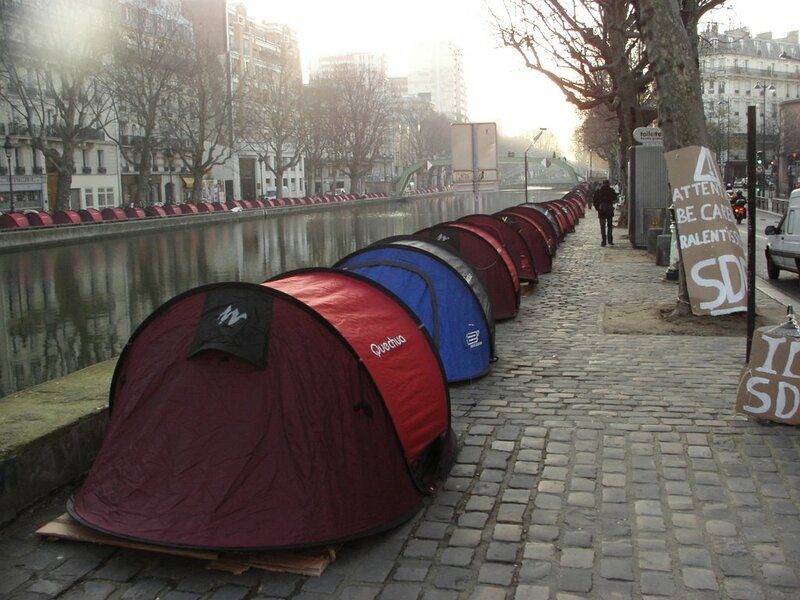 The charity gave tents to 300 homeless people for them to use on the streets of Paris. The historic streets and canals of the city were transformed overnight into a tent city. Suddenly, the homelessness problem was very much in sight and in mind. The stunt prompted such a public outcry that government officials were forced to act. The charity claimed a remarkable victory when the Junior Minister for Employment and Social Cohesion, Catherine Vautrin, announced that the French Government promised to spend more than $10 million on emergency housing. Actions speak louder than words. Identify actions that will catch people’s attention and communicate your message. In another film promotion, the marketers behind King Kong Skull Island decided to bring King Kong to life in high-profile physical locations around Los Angeles. For this “gorilla” campaign, they created scenes of carnage with giant ape footprints in five locations in and around the city. On the beach, the huge footprints left in the sand were accompanied by a wrecked lifeguard’s 4X4 vehicle that appears to have been stepped on by the beast. A similar scene was created in Microsoft Square at LA Live, with broken benches and giant 3D stickers that gave the impression of footprints smashed into the concrete. But the icing on the cake was the footprints near the famous Hollywood sign. They even buried fog machines inside the footprints to add to the overall effect. This guerrilla marketing campaign led to news coverage and countless passersby sharing their experiences on social media. Novelty can be very powerful. Think up novel concepts that tie into your objectives. Don’t be afraid to go big and tackle difficult logistical scenarios. In this example of online guerrilla marketing, Burger King decided to stage a little drama in the comments of their Instagram profile – we think. Well, it started with Burger King posting a pretty normal post promoting their breakfast meal. One user left a comment explaining that his “girl” took longer than expected to order food at the drive-in the previous night. The story made news headlines all over America. However, many speculated that the entire exchange was staged by Burger King themselves. Staged or not, the “breakup” generated a lot of attention. Social media platforms were flooded with comments and speculation. Then, news sites picked up the story and spread it far and wide. Burger King pulled a fast one and it paid off – big time. Stealth and mystery can add to the drama. Find a way to keep people guessing. Effective guerrilla marketing doesn’t need to be expensive or time-consuming. Look for opportunities to create a large impact with minimal resources. In a wealthy country, it’s easy to take for granted our abundant access to clean drinking water. Unfortunately, the vast majority of the world doesn’t have this luxury. In fact, 6 out of 10 people in the world – that’s 4.5 billion people – lack safely managed sanitation. In this guerrilla marketing example, UNICEF’s aim was to draw attention to this atrocity. By giving the residents of New York city a taste of what this dirty, disease-ridden water is really like in the form of vending machines. Each vending machine sold eight different flavors of diseased water: hepatitis, dysentery, malaria, cholera, typhoid, dengue, yellow fever, and salmonella. The guerrilla marketing campaign caught people’s attention. It was a stark reminder of the difficult and dangerous conditions many people must face on a daily basis around the world. Nobody drank any water, but many people donated. What’s more, the stunt was picked up by news channels around the world, helping to spread awareness, and increase donations. Go for the shock factor. To capture attention, think of ways to disturb the day-to-day status quo of people’s lives. This guerrilla advertising campaign from flea treatment brand Frontline involved the general public in a clever and innovative way. Did you fall for it at first? The photo isn’t full of flies or fleas, but humans! Frontline managed to fill the entire floor of this large mall with an image of a dog from above, scratching his ear. The brand knew that when people walked across the floor, they would inadvertently become part of the stunt. They also knew that the illusion would catch the attention of many people on the upper levels and word would spread. Instead of just using a billboard poster, Frontline took people by surprise, got them involved, and promoted their product’s benefit in an extremely memorable way. Get the public involved – knowingly or without realizing. Everyone involved is likely to help spread the word. Identify the core benefit of your product or business and present it on a grand scale. This guerrilla marketing example combined offline and online guerrilla marketing campaigns. When the city of Troy, Michigan, made some major cuts to its public spending, the Troy Public Library was doomed to close. However, when the people of Troy were asked if they’d be willing to pay for their library, the response was an overwhelming “yes.” In fact, 72 percent of Troy residents wanted to keep the library’s funding level – or even increase it! On the other hand, only 20 percent wanted its funding cut to some degree. So why was the Troy Library being closed? Well, it came down to an organization that contested any public proposal which included a tax-increase – regardless of its purpose. Just weeks before the library’s closure, the city council decided to let residents cast one last ballot. The new proposal called for a 0.7 percent tax increase – enough to fund the library for five years. This is when the guerrilla marketing campaign launched its attack. A new group called Safeguarding American Families joined the opposition during the debates. This new group wanted the vote to lose so they could throw a book-burning party once the library closed. As you can imagine, many were angered by the campaign. People left comments on social media saying, “You people are sick,” and, “This is disgusting.” And voters, news outlets, and local leaders took notice. Then came the big reveal. The campaign was a ruse all along. Safeguarding American Families was a group created by the Leo Burnett guerrilla advertising agency. They had been hired to create a guerrilla marketing campaign that would persuade voters to save the library. This guerrilla marketing campaign changed the conversation from increased taxes to save the library. The proposal passed with 58 percent of the ballot and the library was saved. Use reverse psychology and play devil’s advocate to create a powerful emotional reaction. Guerrilla marketing campaigns are risky and controversial by nature. However, there’s a fine line between a lovable prankster and an insensitive a******. If you get it wrong, a guerrilla campaign can backfire – badly. They faced backlash after hiring two men to streak across the field during a major Australian rugby match – with the Vodafone logo painted on their backs. From the start, this stunt seemed guaranteed to annoy rugby players and fans alike. So what on earth made Vodafone think this was a good guerrilla marketing idea? Well, it turns out that the match took place in a stadium sponsored by Vodafone’s main competitor, Telstra. While everyone was passionately engaged in the sport they love, Vodafone attempted to hijack the conversation and turn it into a petty squabble between two corporations. I mean, it’s no wonder it backfired. Like any good guerrilla marketing campaign, this stunt received worldwide attention from the press. However, that attention was deeply negative – not exactly ideal. The public was so outraged that Vodafone’s CEO had to issue a public apology and donated $30,000 to a local charity aimed at reducing sports injuries. People are quick to call out businesses who launch insensitive and selfish campaigns. Don’t antagonize your target audience or make the conversation about you. Remember, all marketing is about your customers. Effective guerrilla marketing is newsworthy, creative, and emotive. Do you know of any other great guerrilla marketing campaigns? Share your thoughts with us below in the comments!